Eliot Katz William T. Ayton - Eliot Katz's newest book is a readable, scholarly volume entitled, The Poetry and Politics of Allen Ginsberg. 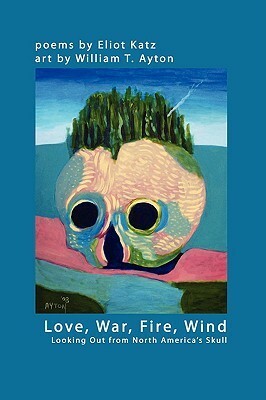 Katz is the author of seven books of poetry, including Unlocking the Exits (1999) and Love, War, Fire, Wind: Looking Out from North America’s Skull (2009), done in collaboration with the artist, William T. Ayton. His first full-length poetry book, Space and Other Poems for Love, Laughs, and Social Transformation was published in 1990, with introductions by Allen Ginsberg and Amiri Baraka, and a front cover drawing by Leon Golub. Katz is also the author of two prose e-books, Three Radical Poets: Tributes to Allen Ginsberg, Gregory Corso, and Adrienne Rich (2013) and The Moonlight of Home and Other Stories of Truth and Fiction (2013). He was a coeditor, with Allen Ginsberg and Andy Clausen, of Poems for the Nation (2000), a collection of contemporary political poems that Ginsberg was compiling in the 18 months before his death in 1997. A cofounder, with Danny Shot, and former coeditor of Long Shot literary journal, he guest-edited Long Shot's final issue, a "Beat Bush issue" released in Spring 2004. His poems are included in the anthologies: Poetry After 9/11: An Anthology of New York Poets; Blood to Remember: American Poets on the Holocaust, 2nd ed. ; The World the 60s Made: Politics and Culture in Recent America; Aloud: Voices from the Nuyorican Poets Cafe; Blue Stones and Salt Hay: An Anthology of Contemporary New Jersey Poets; Identity Lessons: Contemporary Writing About Learning to Be American; Bum Rush the Page: A Def Poetry Jam; Nada Poems; Confronting Capitalism: Dispatches from a Global Movement; and In Defense of Mumia. His long essay, "Radical Eyes," is included in the prose collection, The Poem That Changed America: "Howl" Fifty Years Later. He is coeditor of a bilingual anthology published in France in 1997, entitled Changing America: Contemporary U.S. Poems of Protest, 1980-1995. Called “another classic New Jersey bard” by Allen Ginsberg, Katz has worked for many years as an activist for a wide range of peace and social-justice causes, including a decade spent as an advocate for Central New Jersey homeless families. He currently lives in Hoboken, NJ, and serves as poetry editor of the online politics quarterly, Logos: A Journal of Modern Society and Culture.